Cindis World: Giveaway! A quart of Gold Label Virgin Coconut Oil !!!! Giveaway! A quart of Gold Label Virgin Coconut Oil !!!! 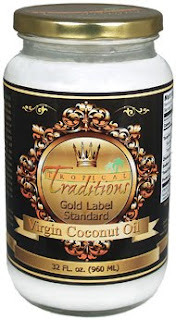 Tropical Traditions sent me a quart of this Gold Label Virgin Coconut Oil to sample and I am highly impressed! I have never tried anything like it! In their book, they show the many health benefits of using Virgin Coconut Oil. First you MUST subscribe to their email newsletter HERE , and tell me in the form that you did it - that is one entry. Follow me on Twitter http://twitter.com/itscindisworld and submit on the form saying you do. Become a FAN on Facebook http://www.facebook.com/cindisworld and submit on the form saying you did. Tweet this post with @itscindisworld and submit in the form that you did. Post this giveaway on your blog and put link to the post in the form . Each form submission, along with your email address is a seperate entry! Giveaway ends April 21st at 12pm EST..... Good Luck!